For our first morning in the Exumas we woke just before sunrise to listen to our daily weather report. We had big plans for today, we were going to visit Iguanaland! We had heard a lot about the iguanas that lived on Southwest Allans Cay and we were finally in the neighborhood. After taking notes on the weather and eating a quick breakfast we put the kayaks in the water and began the short paddle to the island just south of our anchorage. I decided that vegetarian lizards really shouldn’t be too scary even if they did look a little like the Velociraptors from Jurassic park and hopped out of my kayak. There was a sign at the top of the beach in very small print, but I never made it quite that far. The sound of my kayak scraping against the sand must have sounded like a dinner bell to the iguanas. Immediately, the sounds of crunching leaves indicated lizards scurrying through the bushes towards the beach, and soon iguana heads began poking through the grasses at the top of the beach. Within just a couple of minutes the beach was crawling with Iguanas. Stephanie was now completely convinced that staying in her kayak was a good plan. Stephanie kept a sharp lookout to make sure I didn’t get surrounded as I roamed the beach to get some good photos of these Exuma Iguanas. We learned later that this is one of the most endangered lizards in the world, but that could be forgotten easily while surrounded by so many on this tiny beach. The iguanas would usually move pretty slowly, but occasionally one of the smaller lizards would stray too close to a larger one and get chased away. The iguanas were not scared of me and I could get as close as I wanted for pictures. Some of them were more aggressive than others and would charge toward me. If I jumped up and down they would run away a couple of steps before turning around to see if I was done. I ended up jumping up and down quite a bit to keep some of the iguanas at a comfortable distance. 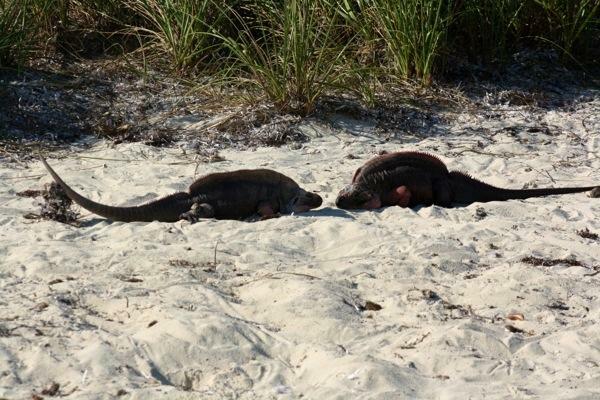 The younger iguanas were darker in color and quite a bit smaller. After taking a lot of pictures and watching the iguanas we decided to kayak around to the other side of the island. The original plan was to walk across the island, but the lack of trails and surplus of iguanas encouraged us to find another route. The beach on the south side of the island was rocky, and inhabited by exactly one iguana that we could see. We explored the rocks and found another iguana hiding out in the fallen palm branches. Stephanie watched one of the younger iguanas hop into a plum fruit bush and climb to the top to get a snack. Successfully traversing the island by myself, I was able to read that informational sign. I learned that the iguanas help to spread the seeds of the plum fruit trees. After watching the iguana in the tree for quite a long time we decided that we should probably get a move on so that we could move Rode Trip to the next anchorage south. We were a little sad to say goodbye to such a pretty anchorage, but we are looking forward to exploring much much more of the Exumas. 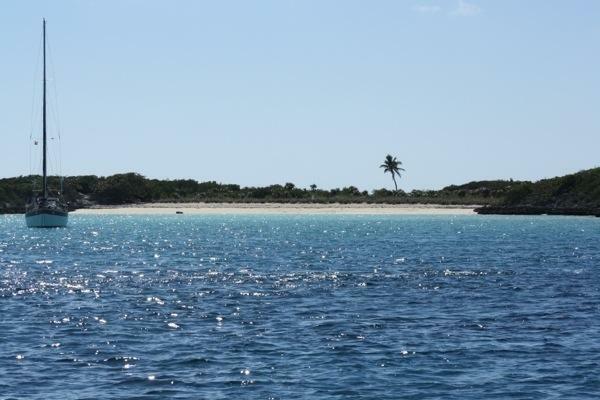 This entry was posted in Uncategorized and tagged 20130206, Allans cay, bahamas, exuma iguana, exumas, iguana, iguanas, Lizards, SW Allans Cay by Brian. Bookmark the permalink. LOVE is all around! Happy Valentines Day! Haha! DONT feed it or it’ll chase you down the sidewalk just like the geese! I am so enjoying your adventure. These pictures at Iguana Land are great. I would be with you Stephanie in the kayak. No way would I be as brave as Brian. But he is the most adventurous person I’ve ever met. Be safe, God speed.